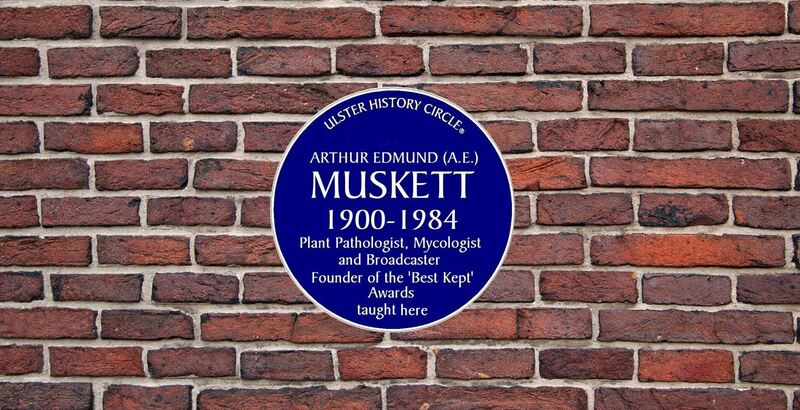 A former distinguished Professor of Plant Pathology at Queen’s – Professor Arthur Edmund Muskett – has been recognised by the Ulster History Circle with the unveiling of a Blue Plaque on Elmwood Avenue. FacebookTwitterProfessor Arthur Edmund Muskett was Head of the Department of Mycology and Plant Pathology at Queen’s for more than twenty years and a distinguished Professor of Plant Pathology and Mycology (the study of fungi). The Ulster History Circle places commemorative Blue Plaques across Northern Ireland and the Ulster counties of the Irish Republic, commemorating men and women who have made a special contribution to society in many areas of achievement, locally, nationally or internationally. The Circle's latest plaque, to Professor Muskett, has been unveiled on Queen’s School of the Natural and Built Environment building on Elmwood Avenue, Belfast, where he worked during his time at Queen’s. It is one of more than 200 plaques around Ulster, with a number already sited on the University campus. The plaque was unveiled by Dame Mary Peters, who had worked with Professor Muskett in the early days of the ‘Tidy Towns’ Project – now better known as the ‘Best Kept Awards’. The event was hosted by the Ulster History Circle and attended by Professor Muskett’s daughter Doreen, son Bryan, their guests and representatives of the University. Queen’s Vice-Chancellor, Professor Patrick Johnston, said: “When Professor Muskett arrived in Northern Ireland in 1923 there were no facilities or personnel concerned with plant pathology. Appointed to a post within the Ministry of Agriculture, with a parallel position at Queen’s, his work initially focused on helping Northern Ireland’s farmers with crop disease problems. He went on to build a department and service with a reputation for excellence around the world. “He was a keen environmental conservationist, who contributed to the popular Ulster Garden radio programme, and he was instrumental in setting up the ‘Best Kept Awards’ to encourage environmental improvement. “In 1985 Professor Muskett’s former students and colleagues at Queen’s founded the Arthur Muskett Prize, which continues to be awarded to a student enrolled in the School of Biological Sciences who achieves the highest mark related to animal and plant disease, pest management, or environmental management. TMedia inquiries to Anne-Marie Clarke (Mon-Wed) or Michelle Cassidy (Thurs-Fri) at Queen’s University Communications Office telephone: +44 (0)28 9097 5310.